Water hammer or hydraulic shock is the loud bang you hear when a faucet or water-using appliance is quickly shut off. The banging is caused by the shock wave that causes the pipes to move and strike against one another or another closeby structure such as wall studs or floor joists. But it isn’t just annoying, it can potentially damage your plumbing system. 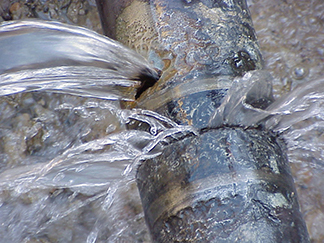 Read on to find several methods of eliminating water hammer. In older homes, water supply systems may have air chambers located on every hot and cold water line or near each faucet or water inlet valve. These chambers are usually located behind walls along with the rest of the plumbing pipes. The purpose of the air in the chamber is to act as a shock absorber for high speed flowing water. Overtime, this can fill up with water, eliminating the air that absorbs shock. By shutting off the water supply and draining the pipes, air can be filled in the chambers again. Installing a water hammer arrestor on each water supply line is usually the best solution for long-term elimination of water hammer. The water hammer arrestor is similar to an air chamber but it includes an air or gas-filled chamber sealed by a diaphragm or piston. The diaphragm or piston moves to absorb the shock from the water. The water and air or gas is kept separated, meaning that water will never need to be drained from the arrestor. When the pressure of the water entering the building is too high, water hammer can occur. Normal water pressure runs between 40 – 80 psi (pounds per square inch). Anything past 80 psi is considered very high pressure and can damage appliances. Installing a water-pressure regulator where main water supply enters the home will help to control the pressure, protecting all appliances and fixtures against high water pressure. After testing if water pressure is higher than normal with a pressure gauge kit from a hardware store, adjust the regulator to a pressure below 50 psi or as needed.